We ask each of our staff to pick a favorite Amber Lotus item to feature on our blog for their birthday. Here is Emily’s choice. Why is Zen Cat one of my favorite calendars? 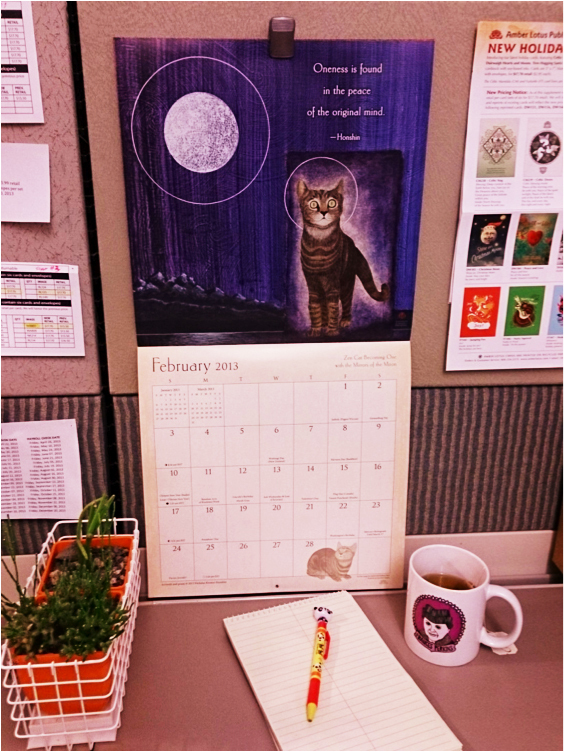 … and here is my desk at Amber Lotus. Kirsten-Honshin’s artwork because he captures the essence of cats. And, cats are wonderful! I do, also, appreciate his peaceful meditations on interconnectedness. But when I look at this calendar, my first reaction is simple joy. 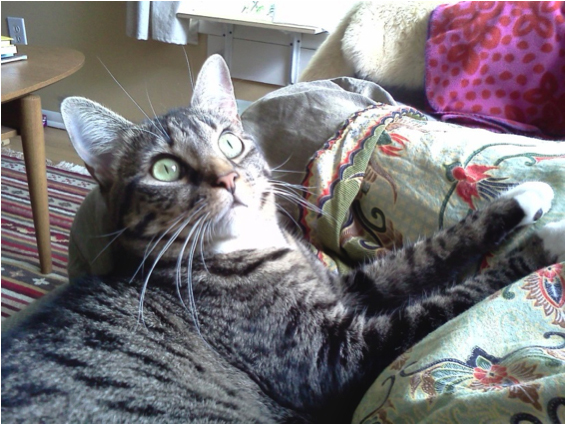 I’m looking forward to the 2014 Zen Cat calendar. Oh, look at that face on the mini version — love it! 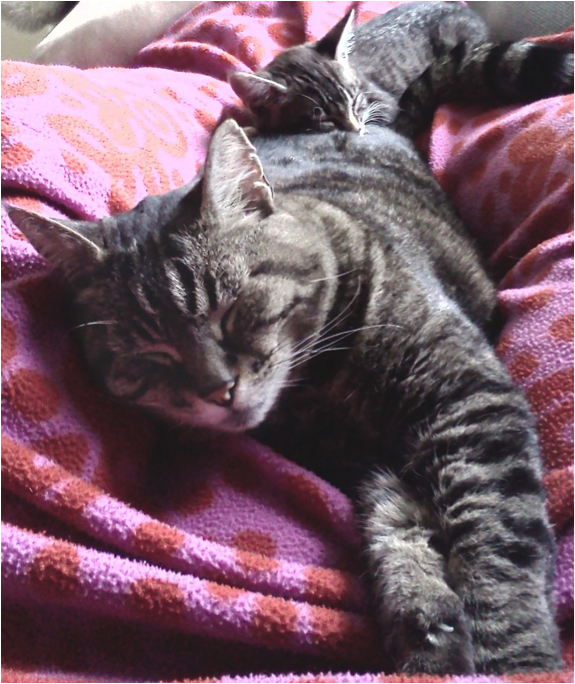 This entry was posted in Artist Spotlight, Inspiration & Spirituality, Pet Care, Poetry and tagged cats, Nicholas Kirsten Honshin, Pets, Zen on November 13, 2013 by Amber Lotus Publishing. Healthy Cat tip of the month. A cat’s food bowl won’t run away like a mouse might, but what if it kept changing location? Cats Love a good game of hide and seek. Move the food bowl to different places, first in the same room, and then, once he gets the hang of the game, in different rooms or floors of the house. Put some challenge back in your cat’s mealtime. 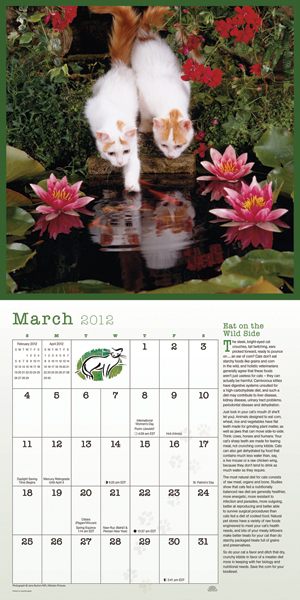 The Healthy Cat Calendar – NEW for 2012 from Amber Lotus Publishing with Eve Adamson’s healthy tips each month. This entry was posted in Pet Care on September 20, 2011 by Amber Lotus Publishing.